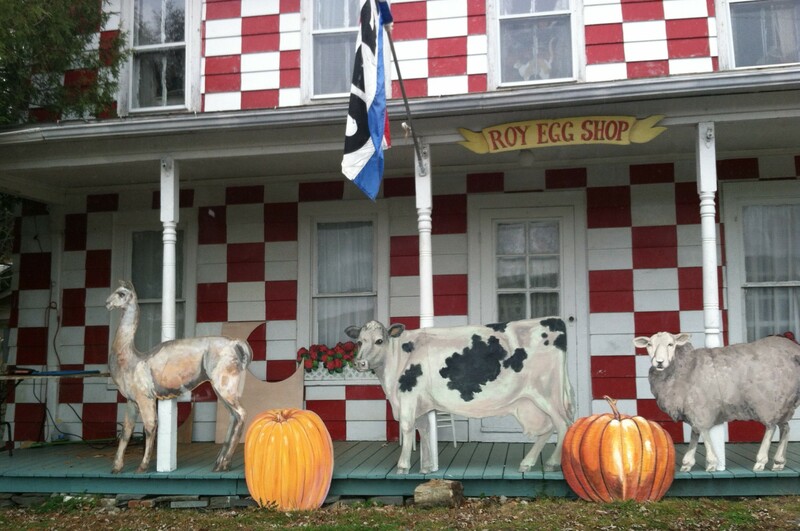 Roy Egg, artist and gallery owner from West Pawlet, VT opens the doors to his farmhouse style gallery Saturdays and Sundays from 10 to 4. Roy’s artwork and workspace fill the multiple rooms in the several hundred-year-old building located a few miles from Rt 22 at the Vermont-New York border. The building was previously a bar called Charlie PQ’s for one hundred years whose bartenders were famous for giving one free beer to each patron. Roy grew up in a Scottish farming family and attended art school in New York City over forty years ago. Shortly after coming to Vermont, a road was named after him, “Egg St.” in honor of his chicken paintings and woodcuts. President George Bush and First Lady Laura Bush hosted Roy Egg at the White House to award his prize-winning painted egg that is archived in the White House Gallery.